Sum-sum-summertime! Beach season is officially here, and at Murray’s we’ve got one thing on our mind when packing a picnic for those epic days in the sun: Cheese! Yes, cheese at the beach! Hot weather means you’re going to want something refreshing and light to snack on. Fresh, spreadable cheeses that won’t stink up your cooler and transport easily are ideal. Here are some of our favorites for the season. Just add some fresh fruit, a big bottle of water or chilled vino, and the soothing sound of ocean waves. Something fresh and light: With the sun beating down and the salt in your hair, there is no need for anything heavy. 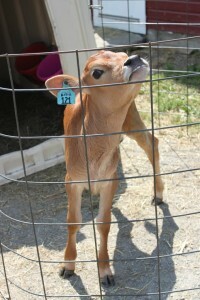 Bring on the Petit Billy, a delightful chevre that doesn’t tax your palate or your wallet. It’s creamy and bright like a tangy whipped cream cheese, and pairs just as fabulously with fresh fruit. Something rich and triple crème-y: A couple of bites is enough to satisfy—you are still wearing a bathing suit, right? Nettle Meadow Kunik should do the trick. A small round of rich, velvety goodness hits the spot and never leaves you wanting. We love this with fresh strawberries or raspberries. Something soft: Seriously, if you are anything like me, you’ve already packed a towel, water, sunblock, reading material, bocce ball… the last thing you need to be schlepping is a cheese knife and board as well. 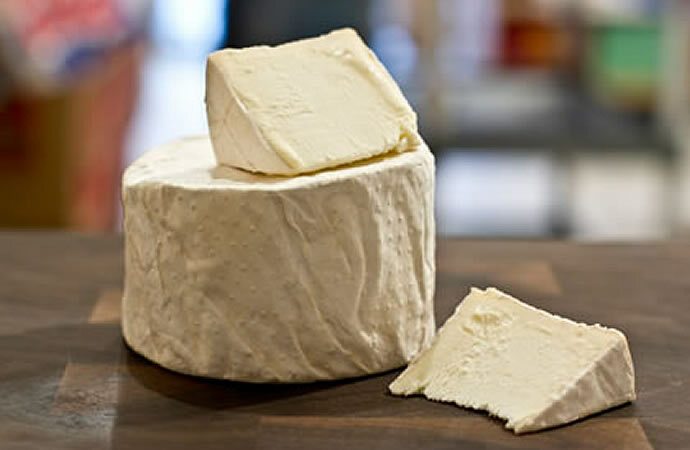 Brebisrousse D’Argental is light and creamy, and has plenty of flavor without being super pungent. Now all you need is to find space for those petit toasts to scoop up the orange-rinded sheep-y goodness. Something smoky to put you in the mood for BBQ: This is a no brainer – River’s Edge Up in Smoke! A delicate chevre from Oregon gets wrapped in a smoked Maple leaf and spritzed with a touch of bourbon. The finished product is tangy and fresh with a meaty-smoke subtlety that makes your mouth water. You’ll wonder why your craving for ribs increases exponentially. Something with a bit more heft: Yeah, we said to stick to light and soft, but just to round out our list, let’s throw in Cave-Aged Landaff. Reminiscent of a cheddar, this semi-firm raw cow’s milk cheese aims to please. Pre-slice for snacking ease. Stephanie Butler was the grand prize winner of our Facebook contest for a trip to Vermont to attend the VT Cheesemakers Festival. She was gracious enough to contribute this blog post about her experience on the trip. Thank you, Stephanie – we’re glad you had such a great time! If you’ve never eaten a half-pound of cheese on a tour bus in a McDonald’s parking lot in Nowheresville, Massachusetts, then obviously you’ve never gone on a trip with the Murray’s Cheese crew. I was lucky enough to win two tickets to the Vermont Whey-cation, and my boyfriend and I spent a whirlwind 40 hours tasting cheese, smelling cheese – by Sunday night I think we were even exuding the stuff through our pores. 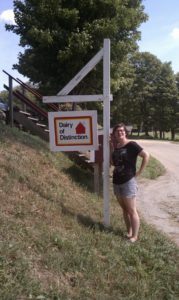 Our trip started with a tour of Spring Brook Farm’s Cheese House. 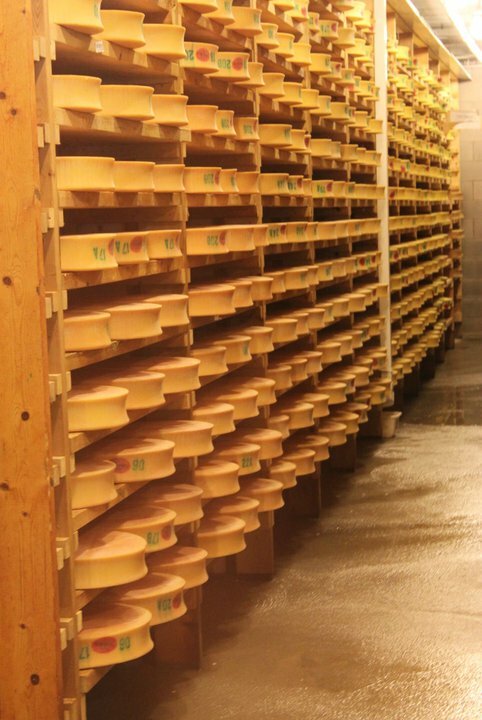 Lead cheese maker Jeremy Stephenson took the time to guide us through each aspect of the 18-month-long process it takes to create one wheel of their tasty Tarentaise. 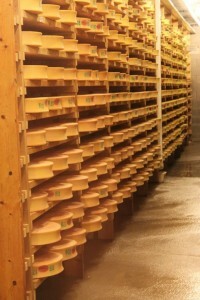 Their cheese caves were something to see: twelve rows of wooden shelves with hundreds of cheeses waiting their turn to be washed and rotated. After the tour we got some time to sightsee around the beautiful grounds, where I met and fell in love with a sweet Jersey named Daisy. On to dinner at Bluebird Tavern, where we were treated to a feast of Vermont’s finest foods. Allison Hooper, the founder of the Vermont Butter and Cheese Creamery, joined us for the meal, where each dish included one of her cheeses as an ingredient. My favorite had to be the whole roast pig on grilled bread with baked goat cheese and pickled blueberries, but the heirloom tomatoes with basil and mascarpone were certainly a close second. I washed everything down with pints of Hill Farmstead Brewery’s Edward, an American Pale Ale I can’t wait to try to track down here in Brooklyn. Add some banana pudding with whipped goat cheese in individual jelly jars for dessert, and I slept that night like a bump on a Vermont log. 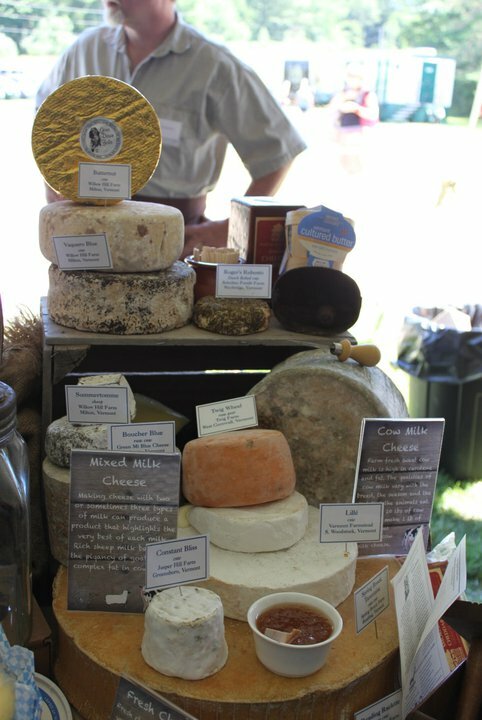 We awoke the next morning eager to truck off to our ultimate destination: the Vermont Cheesemakers’ Festival at Shelburne Farms. I expected the festival grounds to be gorgeous (it was originally a summer home for the Vanderbilts), but I really didn’t have any idea just how beautiful it would be. Right on the shores of Lake Champlain, with the hazy Adirondacks across the water, I was ready to make plans to move to Burlington right then and there. The festival more than lived up to the setting, with cheese makers sampling their wares next to truffle makers, beer brewers, picklers, and bakers. Non-cheese highlights for me were the Vermont Smoke and Cure booth, which gave away generous samples of delicious pepperoni (available at Murray’s! ), Red Hen Baking Company’s yummy wholegrain loaf (we bought the last one), and the kind ladies at the Vermont Maple Foundation booth who gave us tastes of maple cheesecake. As for cheeses, I loved the creamy ricotta from Narragansett Creamery, Vermont Shepherd’s rich and tangy sheep cheeses (ed. note: Vermont Shepherd cheeses will be available this fall), and just about everything from the Cellars at Jasper Hill. 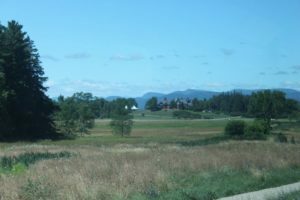 After taking in the festival barn, we adjoined to the huge waterfront lawn, where fellow picnickers had set up blankets, wine buckets, and hiking chairs. It was an idyllic scene, for sure, with barefoot children running around, 4-H teenagers showing off their baby goats, and a gentle breeze floating over our heads. I lunched on some Vermont pizza while my boyfriend chowed on a grass fed hamburger, and we toasted our sample wine glasses full of local rosé. “To the good life!” we said, and, for two days in Vermont, it certainly was. Beth Ann from Murray’s Wholesale department makes friends with a goat. To stay up to date on the latest news from Murray’s Cheese and hear about contests like the Vermont Wheycation Giveaway that Stephanie won, be sure to like us on Facebook and follow us on Twitter! Who You Callin’ A Hooligan? Have you ever wanted to get your hands on a Hooligan? No, I don’t mean one of us cheesemongers behind the counter, I mean a REAL Hooligan, like the ones we made at Cato Corner Farm on a recent Thursday. 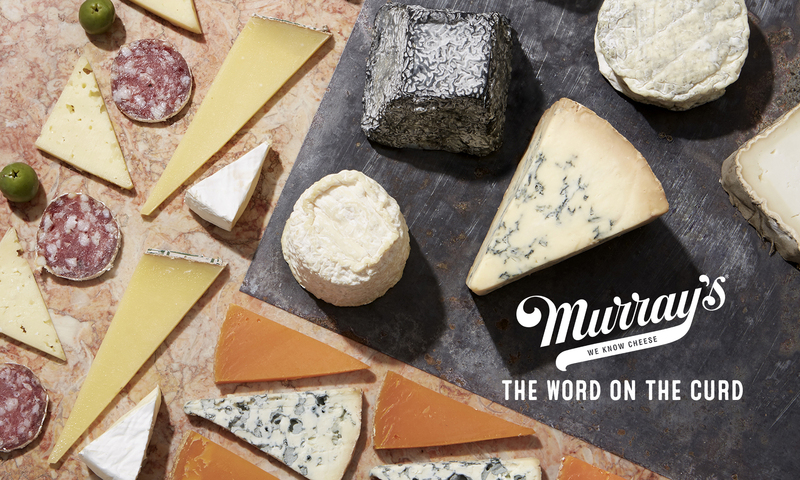 If you love cheese as much as we do at Murray’s, you’ve got to know a cheese’s ins and outs, its story, it’s SOURCE. 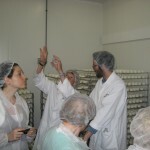 So, sinking our hands right into the cheesemaking process was, in fact, wonderfully appropriate. The Murray’s crew and I departed Bleecker Street and headed across state lines to farm country, also known as Connecticut. We arrived at Cato Corner Farm just after noon that Bloomsday and a small gang of friendly but boisterous dogs heralded our arrival. As we poured out of the mini-van, the smell of hay, barn and warm sunshine welcomed us without words; it was going to be a good day. 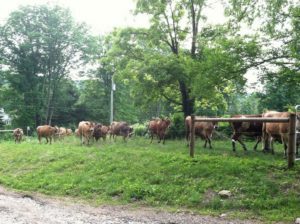 The cows at Cato Corner gave a warm welcome. 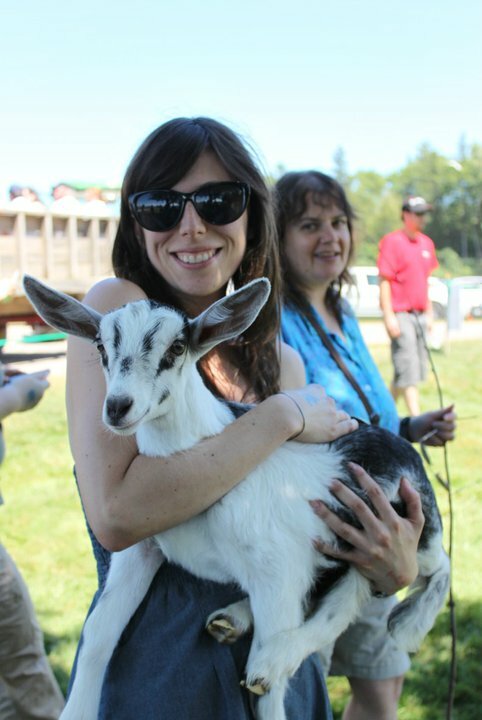 Liz, owner of the farm, greeted us with a grin, and a laugh, “You must be from Murray’s.” I was sure my Ray Bans, beat-up Beatles t-shirt, and red cut-offs would make me look farm chic, but alas, I fear my oversized flower tote containing bronzer and sunscreen gave me away. 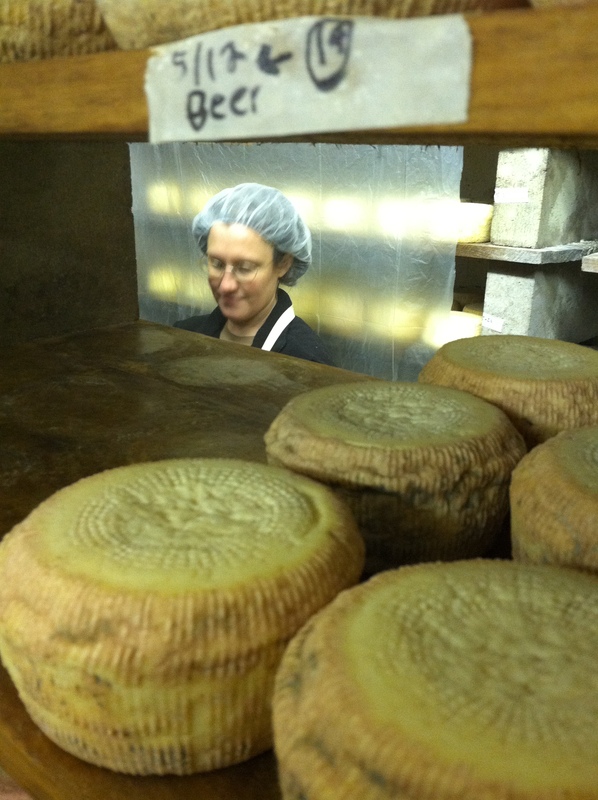 We freshened up and then met Mark, Liz’s son who oversees the farm’s cheesemaking. He took us underground to see affinage at work in their aging facility, which was not unlike the cheese caves beneath our Bleecker Street store. 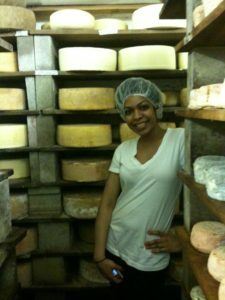 I was amazed by the sheer number of cheeses being aged at one time in the small farm’s complex. Shelves of old and young wheels formed passageways that towered over us like halls of an antique library (and the smell wasn’t that dissimilar either). Incredibly enough, the thick, dull brown rinds on the large wheels and the (almost cute) furry blue and grey rinds on the smaller wheels were derived from ambient molds that occur naturally in the caves themselves (local mold makes local gold! Ha!). Yours truly, in good company! Next up on the docket was cheesemaking. Now, if you’re as big of a cheese nerd as I am, you’d understand why I was giggling through the whole sanitizing process. There I was, every appendage covered in plastic yet I couldn’t help but clap with joy in a ruffled frenzy at the thought of molding curd with my own fingers. We surrounded the enormous bath tub (at least it look like one) filled half way with what looked like an untouched layer of plain yogurt. Having added the rennet an hour before, Mark said, the milk should be firm enough to cut by now – and with that, he pierced the creamy film, and to my amazement, it didn’t blob into a soft creamy mess, but yielded to the knife like a limber slice of tofu. The curd was ready. He began slicing the curd into half inch pieces using a large wire cutter. 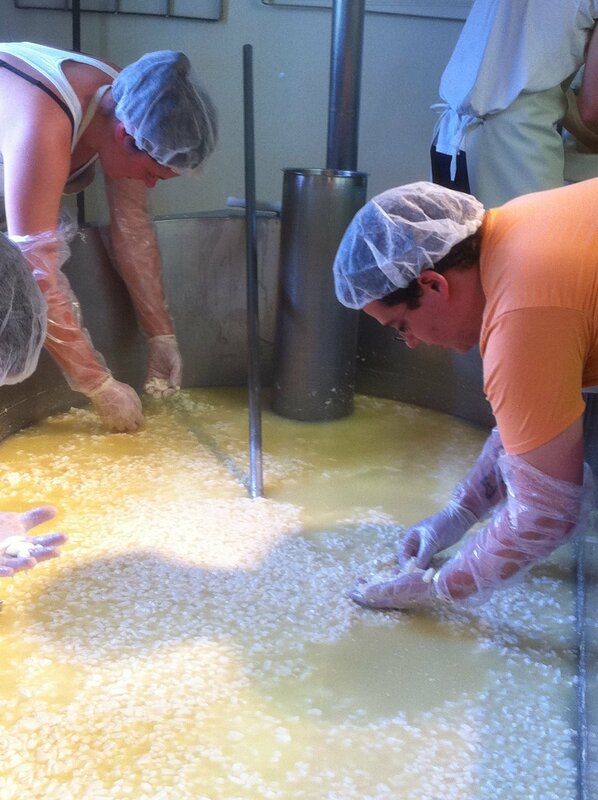 Then we took turns dipping our hands into the vat and milling the curds into finer, more even bits. The curd itself tasted like sweet, warm milk Jell-o, but in the best way. After draining the whey, we scooped the curds into baskets, piling the milled bits into heaping snow cone-esque forms for further drainage and shaping. Minutes later, we popped the curds out of the molds and voila – curds in their perfect form, ready to join their comrades in the aging room, but with the added touch of Murray’s handiwork; hooligans indeed. Stirring the curd that will later be molded into Hooligan. We concluded our cheese-making escapade with a picnic lunch outside where we all enjoyed sandwiches, charcuterie, pickles, farm fresh fruits and veggies, and of course, cheese. We tried a very special cheese only available at the farm, the 1 year aged Anniversary Bloomsday, made a year ago to the day! It was nutty and sharp with crystalline pops of sweetness and a pale, custard yellow paste that sang of summer sun and happy cows. Naturally, we also sampled Hooligan, a large muffin shaped cheese with a dense, flaky center and mildly pungent rind. We finished with Misty Morning, a creamy, earthy blue that was lovely with bites of freshly picked strawberries. After touring the farm and thanking the cows for their generous bounties, we climbed back into the mini-van, ripe Hooligans in tow (think ripe plus hot cramped car… serious funky town), and headed back to the West Village. 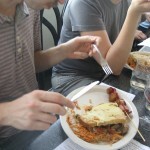 Great cheese and great people; I could not have asked for a better Bloomsday. Murray’s Grand Central Store Director, Will Whitlow, took a trip this October to Salone del Gusto in Northern Italy. 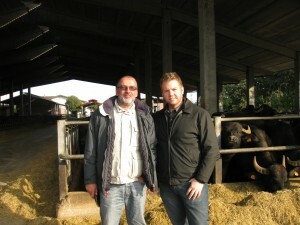 On his trip he made a stop at Quattro Portoni, one of Italy’s premier water buffalo farms. What comes to mind when you think of Italian cheese? The great cow’s milk cheeses like Parmigiano-Reggiano? Or the thousands of sheep milk pecorinos? Eventually you will probably think of mozzarella from the south of Italy. But is it really made from water buffalo milk? You can’t imagine how often we’re asked just that. Yes, the large, black, big-horned and wooly creatures produce astounding milk for cheesemaking. Last week, I visited a unique farm in the province of Bergamo in Lombardy called Quattro Portoni. 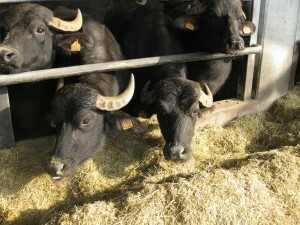 In the last 10 years, the Gritti brothers, Alfio and Bruno, have transformed their family’s cow dairy into one of the standout water buffalo dairies in Italy. Located in the heart of the Taleggio-making area, they were looking to distinguish their farm from those that sell milk to the big cheese plants that surround them. Bringing the southern tradition of water buffalo to the north was exactly the right choice. Quattro Portoni, or Four Gates, is named after the 13th century gates into their moat-encircled town of Cologno al Serio. And a couple of their new, modern cheeses carry the names of those ancient, individual gates…Casatica and Moringhello. Quadrello is their spin on Taleggio, the classic cheese of their region. It’s creamy, sometimes gooey and always rich and a bit pungent. Gran Bu, the big buffalo, is just that, a physically big and big flavored firm cheese with sweet and nutty overtones. One thousand water buffalo live on the farm. Of those, 270 are being milked for cheesemaking. Since water buffalo only give about two gallons of milk per day (cows can give up to four gallons), it takes many more water buffalo to have enough milk for a thriving cheese business. Everything from breeding to calving happens on the Quattro Portoni farm, and most of the crops they feed the buffalo are grown there too, with the addition of some of the spent barley from the beer producer down the road. Theirs is a fairly self-sustainable operation. The day of my visit, the pristinely clean and shiny cheesemaking room was busy with 2 cheesemakers and 4 helpers making Blu di Bufala, their cube-shaped blue with light veining, a rich, fatty mouthfeel and a minerally tang at the finish. The buffalo had been milked at 4pm the previous day and 4am that morning. The milk from both milkings was pasteurized and in the vat by 6am. They work in three small open vats because buffalo milk is a bit more delicate and feeble than cows. It’s easier on the milk to work it in small batches. The milk for Blu di Bufala is coagulated and cut in the vat, then the curds are drained on worktables (the whey is used for fresh ricotta). 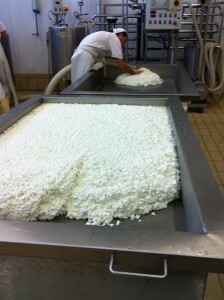 Once the curds have drained, they are cut into slabs about 1″x3″x8″ and layered loosely into the forms. This is a laborious task and all of the cheesemakers and helpers must work together quickly to get all of the curds into forms. Once all of the forms are full, they will rest for a few hours, be flipped twice and left to sit at room temperature overnight while gas is produced inside the “wheel” making little spaces for the blue to grow. The following day, they’ll be flipped again and brined. About 120 wheels were made from this batch and they are now aging in the farm’s temperature and humidity controlled aging rooms. This is old-school, hands-on cheesemaking. The cheese plant down the road making 100 times more cheese has the same number of cheesemakers. Machines cannot make cheeses like those produced by Quattro Portoni. There isn’t too much that can draw me out of my apartment at seven o’clock on a Saturday morning. Promises of coffee and the cheese adventure of a lifetime, however, made this Saturday a little different. I, and 34 like-minded cheese adorers, arrived to Murray’s bright and early, eager to journey to the second annual Vermont Cheesemaker’s Festival. We were beaming. The sun was, well, not. Likely on an errand, we hoped it’d return soon. Goodie bags, bagels, and coffees in hand, we set out into the northern morning. It was around the point where 17 meets I-87 that I think we all began to notice our new terrain. The color palette had shifted dramatically: our urban grays changed in favor of new greens and blues, the topography likewise ruffled and varied. The consideration of our environment could not have been more appropriate as we pulled into our first stop, The Farmer’s Diner in Middlebury, VT. 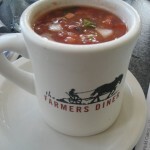 Tired of the commercial food scene, the diner purchases as much as possible from local farmers. They are currently spending an impressive 83 cents to the dollar on products from within 70 miles, all ingredients with only the most enviable pedigrees. Greeted with Raspberry Sangria by Chef Denise, we were honored to celebrate their mission. While she delivered us a four-course feast and we quieted our stomachs, we heard from the local and charismatic cheesemaker Steve Getz of Dancing Cow Farm in Bridport, VT. It was an excellent taste of what was to come. With satisfied bellies and happy spirits, we rejoined at the bus. 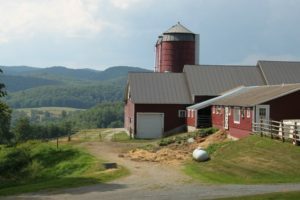 Driver, and whey-cation alumnus, Sylvester adeptly maneuvered us across a beautiful mountain range to our next stop, the Vermont Butter & Cheese Creamery in Websterville, VT. Seemingly joined by fate, cheesemakers Allison Hooper and Bob Reese pioneered the company in 1984. Though it’s hard now to imagine Vermont without its artisanal cheeses and locavore ethics, the pair started as dairy mavericks. Allison was even so bold as to foresee Vermont as cheese’s Napa Valley. Today, their spirit is just as alive, and their approach to production has barely changed, except for maybe a little more cows’ milk and fancier gadgetry on site. Wearing lab coats, hairnets, and protective booties, we played cheesemakers for a day as we toured the drying room, laboratory, production spaces, and churning room. Even more impressed by the cheesemaker’s duties, we gathered again to taste the final products, the little gems that quietly explain why it’s all worth it. After we checked in to the hotel, which boasted a pool, sauna, and all the luxuries due a proper cheese lover, we found ourselves at the festival’s kick-off cookout. Shelburne Vineyards hosted the night, and naturally, we were invited to tipple on the property’s wines and other local brews. A light drizzle and a local band made the soundscape as we lined up to get one of Marc Druart’s delicious burgers. As the Murray’s crew gathered to sit and eat on the grass, I realized that it was one of those iconic summer moments that I will treasure for the rest of my life. As the night closed, we made our way back to the hotel. Though we were all tired from a busy day well spent, I don’t think any of us could temper the excitement stirring for the coming day. At last, the time had come. In spite of all of our anticipation, I don’t think anything could have prepared us for the beauty of Shelburne Farms. The 1400+ acre estate sits on the shores of Lake Champlain, with silhouettes of the Adirondacks finishing the landscape. The farm’s buildings and stables are veritable agricultural castles. Built in 1886 by Lila Vanderbilt Webb, and William Seward, the estate – now also an inn, nonprofit, and restaurant – maintain a presence of another time, where the relationship to the land is reciprocal and tender. Few communities that can mirror that sentiment like the producers of Vermont. 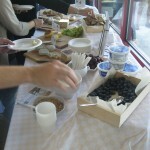 The festival’s arrangement was notably casual. 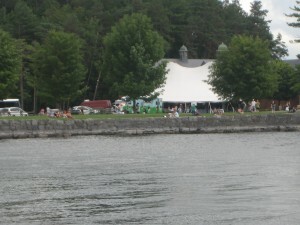 We entered through a large tent housing old friends and new, tables running the spectrum from Cabot to the Vermont Cheese Council. One of the most surprising was a producer offering local ice cider (Eden Ice Cider Co.), made in the style of the famous and luxurious ice-wines. At least a few Murray’s employees escaped with a bottle or two. 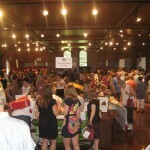 After the tent, the rest of the producers were set up in long great halls within the permanent structures of the farm. 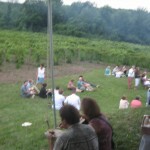 In total, there were 50 cheesemakers, 20 wineries and breweries, and 15 other artisanal producers, all of whom offering generous and wonderful samples. In case our palates needed a rest, there were a few seminars and demos to distract the mind, not to mention the entire estate grounds to explore. Any of us could have spent days at the festival, but alas all things must end. With goodie bags refilled, souls rejuvenated, and perhaps some career-paths drastically altered, we boarded the bus for the long return home, already looking forward to next year.